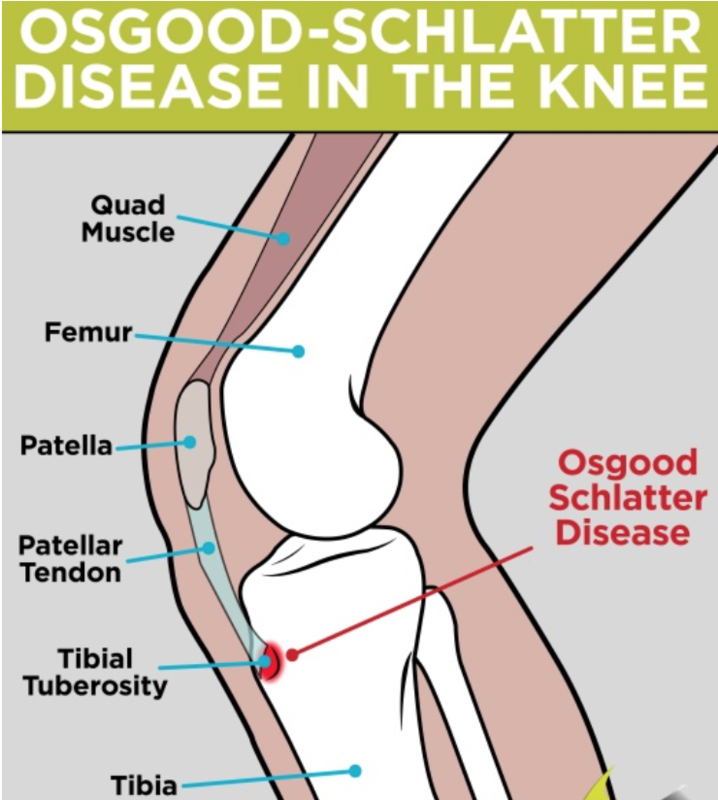 Osgood Schlatter’s Disease (really a disorder and not a disease) is an overuse injury caused by repetitive forces generated by the quadriceps and transmitted through the patellar tendon’s insertion point on the tibial tuberosity (the point where the patella tendon inserts onto the tibia). The tibial tubercle or tibial tuberosity is made up of a relatively soft apophyseal cartilage that is not as strong as bone. Osgood Schlatter’s can cause pain, swelling, and enlargement of the proximal tibia at the patellar tendon’s insertion point. In rare cases, the repetitive stress at the tibial tuberosity can lead to an avulsion fracture. We train a lot of youth athletes, both locally and remotely, and one of the common questions that parents have relating to this topic is how does my son or daughter continue to train or play their respective sport with having Osgood Schlatter’s Disease? Are there exercises or stretches to help? What should I avoid? Do I need to shut them down completely? These are all relative questions and I hope this article helps answer some of them for you! Due to the immature form of the skeletal system during adolescence and the repetitive, high forces that youth athletes generally produce, it is most commonly seen in males ages 10-15 and females ages 8-13. This means adolescent athletes are the most susceptible to Osgood Schlatter’s Disease! It is important to know the types of exercises that may cause worsening of the disorder. Squats, lunges, and other exercises that require flexion to extension at the knee joint typically causes pain in those with Osgood Schlatter’s Disease. Other exercises that place high compressive forces on the tibia like jumping, landing, and other plyometric type exercises should be avoided during this sensitive time in a young athlete’s career. Athlete’s should still work to develop strength and improve flexibility / mobility around the knee and hip joint, so stopping your training completely might not be the best decision. Here are a few exercise recommendations! It is also important to consider that certain tempo squats and modified lunge variations may be suitable for athletes with Osgood Schlatter’s as long as it does not produce any pain. 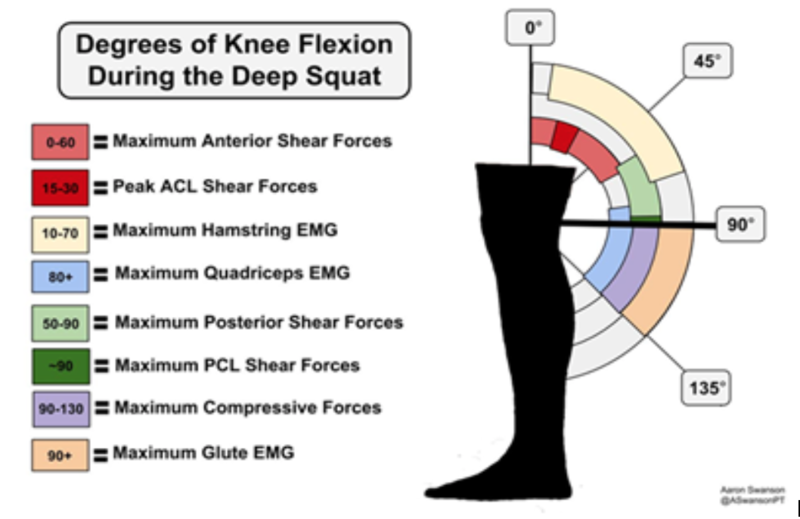 Reducing range of motion of squats and lunges above 90° of knee flexion may be a suitable alternative for Osgood Schlatter’s athletes. When an athlete squats to 90° or lower it produces maximum quadriceps muscle activation and maximum compressive forces on the knee. The increased quadriceps force production and compressive forces may cause increased pain in those with Osgood Schlatter’s. If you have any questions regarding you son or daughter’s training program OR would like to train with us locally or remotely, please send us an email at support@wassermanstrength.com!